Beer dispensers are designed to house kegs or bottles of beer at the perfect temperature for pouring and serving. Keep your beers, ciders, and sodas ice cold for serving to thirsty customers with the help of these bottle coolers. Glass chillers and frosters are designed to boost profits by providing the customer with attractive frosted glasses that’ll keep drinks ice cold. These back bar coolers keep bottles cold and within reach of your busy bartenders, while the glass door coolers are perfect for merchandising. Keep bottles of red, white, sparkling or rose wine the proper serving temperature by storing them in these commercial wine coolers. Keep your happy hour specials on tap for instant access with the help of these cocktail dispensers. To keep your bar and all of its equipment in working order, be sure to try these parts and accessories for bar refrigeration. If your business serves wine, a commercial wine cooler is an excellent choice that can hold large quantities of vino. 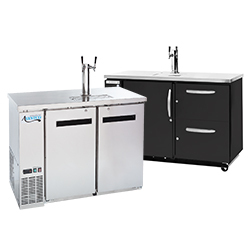 Our inventory of bar refrigeration equipment also includes cocktail dispensers that keep your signature mixed drinks on hand and ready to serve. Best of all, our bar refrigeration is sold at affordable low prices that allow you to stock up on everything you need without breaking the bank. For related products, check out our bar mats and shelf liners, corkscrews, and cutting boards. 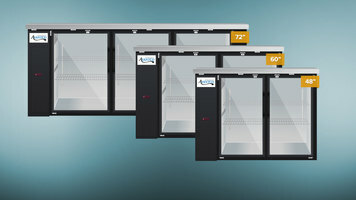 If you're wondering where to buy bar refrigeration, we have a large selection of bar refrigeration for sale at the lowest prices. Is there nothing so exciting, so delicious, so refreshing as a perfectly mixed drink? The layers of color, the multiple levels of flavor, the beautiful blend of recognizable tastes dancing with daring dashes of your favorite liquor, all of these things magically meld in a mixed drink to make memorable (or sometimes not so memorable) nights for your customers. Crafting mixed drinks is truly a science, which is why it is often called "mixology." In this guide, we'll take a look at several key components to help your bar staff become proficient professors in the field of mixology and craft the coolest cocktails in town. Avantco back bar coolers provide the added beverage storage space you need to ensure that your guests never go thirsty! For additional details and to learn about the different styles available, check out our short video. 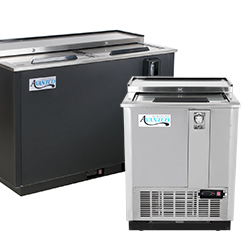 If you’re shopping for restaurant equipment for your bar, bistro, or nightclub, our selection of bar refrigeration equipment is a great place to start. These products are perfect for storing and displaying beer cans and bottles, frosted glasses, and bottles of wine. 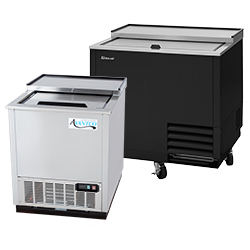 These products are ideal for a variety of different foodservice settings, for example, you can use a wine and beverage cooler behind the bar at your restaurant, winery, or brewery. We also sell parts and accessories for bar refrigeration and draft systems, so you’ll be able to keep your bar running smoothly. 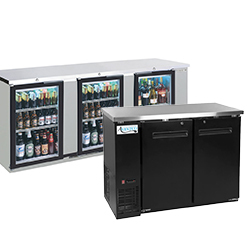 A beverage cooler is the perfect choice to keep your beer cans or wine bottles chilled, or you can choose back bar coolers with clear doors to merchandise your delicious brews. 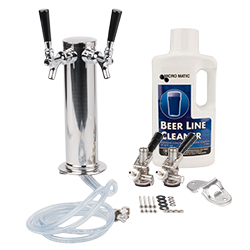 If you use a tap system with kegs, choose a beer dispenser to keep ice cold beer on tap and ready to serve. Glass chillers and frosters are the ideal accompaniment to your bar refrigeration, as they ensure glasses are chilled to help beer maintain the proper temperature.